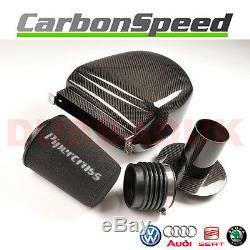 VW GOLF MK6 2.0 GTI CARBON AIR BOX INDUCTION INTAKE KIT + PIPERCROSS FILTER Quick Overview. 05 Carbonspeed Air Intake System. Replacing the factory air scoop at the front of the engine bay. CAI kit gives a typical increase in torque of over 10%. Airflow increase of approximately 50% over the factory system. Comes complete with a full fitting kit. To Fit The Following Models. VW Golf Mk6 GTI 2.0 Turbo 210 Bhp. Golf Mk6 2.0 TSI Engine Code: CCZA 07/09. Golf Mk6 2.0 TSI GTI Engine Code: CCZB 04/09. Why Fit A Carbonspeed Air Intake. Flattens Torque Curve (engine is less'peaky'). Enhances Engine's Volumetric Efficiency. Enhances Sound of Turbo Diverter Valve. Works with All Aftermarket Diverter Valves. Installs in an Hour (does not require bumper or headlight removal). Maintains All Factory Emissions Components. Fits Both Manual and Automatic Transmissions. Unique Thermal Barrier Composite Construction Ensures Low Inlet Temperatures. Designed to directly replace your standard air box and air filter element, Carbonspeed and Pipercross performance panel air filters can be fitted in minutes for a lifetime of performance engine protection. Replaces your restrictive paper air filter. Will last the lifetime of your vechile. About Pipercross Pipercross has been making high performance air filters for the motor sport and domestic markets for over 25 years. Based in Northampton, England Pipercross is situated in the country along with some of the biggest names in motorsport engine design and manufacture in the world. 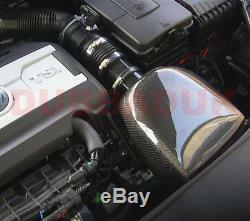 05 Airbox Type: Carbon Air Intake - CAI Air Filter Included: Pipercross (Oil Free) Reference OE/OEM Number: CS. 05, CI100020, 69-9756TFK, PK370, 57S-9501, FMINDMK6 Pipercross CrossRef: PP1624 PK370 K&N Part Number: 69-9756TFK Forge Motorsport Cross Ref: FMINDMK6 Haz Motorsport. The item "VW GOLF MK6 2.0 GTI CARBON AIR BOX INDUCTION INTAKE KIT + PIPERCROSS FILTER" is in sale since Thursday, June 22, 2017. This item is in the category "Vehicle Parts & Accessories\Car Tuning & Styling\Air Intake & Induction\Other Air Intake & Induction". The seller is "haz_motorsport" and is located in GB.